Independent business people own and operate McDonald's restaurants in thousands of communities around the world and are committed to being good corporate citizens. 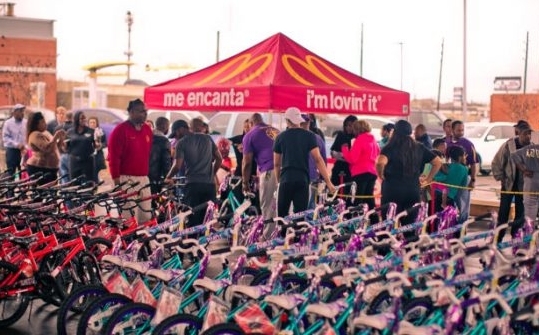 Local Houston area McDonald's owner/operators are regularly involved in local education, community programs and charities, using these good works to improve the lives of children and their families and strengthen communities. However, this story was not being told or amplified on the local level. The McDonald’s Owner Operators Association of Greater Houston (MOAGH) engaged CKP to overhaul their public relations and content marketing efforts and help tell the brand story consistently and compellingly. Increase reach, impressions and positive interactions on social media. Not only did CKP dramatically improve PR impressions, number of placements and earned media value, but McDonald’s of Houston was consistently the top ranked co-op in the nation in 2017 for number of placements, earned media impressions and earned media value, vastly outperforming its 2016 metrics and other US markets. Primary results for 2017 included $7.1 million in earned media value (a 442% increase over 2016), 40.1 million earned media impressions (a 1,019% increase over 2016) and 710 placements (a 377% increase over 2016). Secondary results included a year over year lift in sales and guest counts, with direct correlation of surges in sales to CKP messaging and media efforts. Most notably, Following CKP’s campaign for Big Macs, sales of Big Mac items in the Houston market surged by 90%.